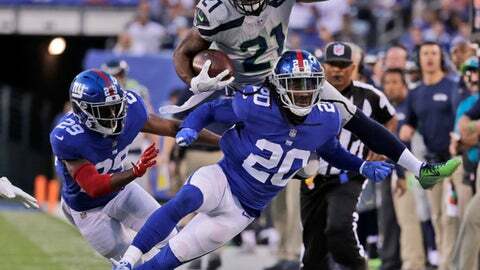 EAST RUTHERFORD, N.J. (AP) New York Giants cornerback Janoris Jenkins has been suspended indefinitely for a violation of team rules. The suspension takes effect immediately, meaning Jenkins will miss Sunday’s home game against the Rams. Jenkins was told Tuesday he was suspended. Coach Ben McAdoo said he will review the status of the suspension next week. Jenkins is the second Giants cornerback to be suspended this month. Dominique Rodgers-Cromartie was suspended on Oct. 10 after he left the team’s facilities before a practice. Rodgers-Cromartie missed the team’s Oct. 15 game at Denver, where the Giants won 23-10. He returned to the team the following week. The Giants returned to practice Monday after their bye week and Jenkins wasn’t with them. McAdoo said he had been excused for personal reasons.